So it’s the All-Star break. The Bruins don’t have another game until next Tuesday, Jan. 28th. The Bruins have played 49 of their 82 game schedule and are still in the playoff structure at the 3rd spot in the Atlantic division. However, there are still games for other NHL teams over the next few days, including Caps @ Leafs and Yotes @ Habs. And the Habs are tied with the Bruins, behind by only a single ROW and a game in hand. Anyway, it’s still not a bad spot to be in. What IS a bad spot to be in? Well, Tuukka Rask has been on fire lately. That is until late in the 1st period on Saturday. "Obviously Tuukka's a huge part of our team, he's been playing great for us…we'll be hoping the best for him." Yes, he got run over by Filip Chytil & Charlie McAvoy,, was crushed into the goal pipes and has a concussion. It looked pretty bad. Chytil is flying at the net with impressive speed, and Tuukka slides forward to meet him. 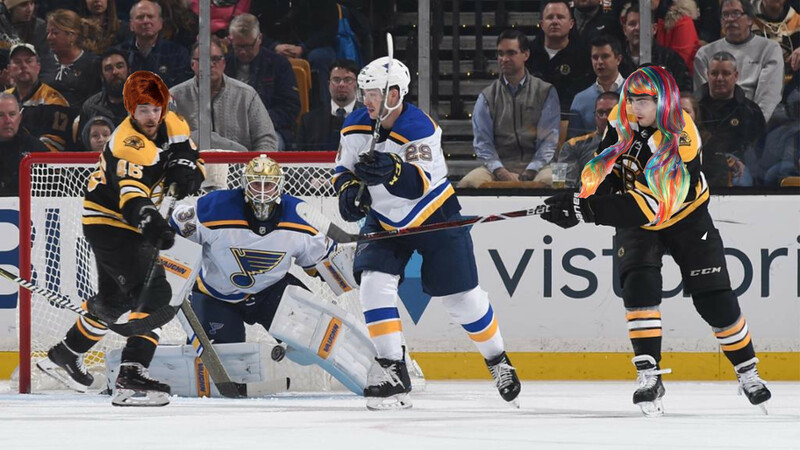 Chytil flings the puck over Tuukka and into the net, and makes a sharp turn to his left, and thus might be able to avoid contact with the goaltender, if it were not for Bruins defenseman Charlie McAvoy, who checks Chytil into the air, and into Tuukka’s face. Anyway, Tuukka won’t be playing hockey for a while. 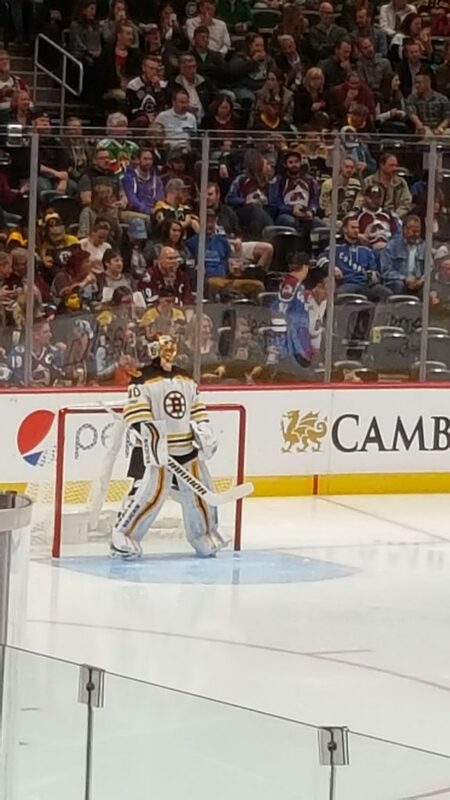 For the injury to occur just before a 9 game break is probably good timing, but considering how miserable Tuukka looked when the trainers were working with him as he lay prone on the ice, I would not be surprised if his season was over. This brings up the question of who is currently the 3rd goaltender in the Bruins stable? Dan Vladar? Zane McIntyre? Whoever it is will likely start more than a couple of games for the big club, especially since Jaroslav Halak has not been playing particularly well as of late. It was interesting to note that Andrew Raycroft was on the in-stadium broadcast team during Saturday’s game and apparently was contacted by the team as a possible emergency option in case of a 2nd goalie injury in that same match. Tagged Charlie McAvoy, Tuukka Rask. Bookmark the permalink. At the office today. Chilly out. Was not a fan of getting the car cleaned off. Could have been better at getting the car cleaned off (though admittedly my cleaning job was better than at least 60% of the people out there). My car’s wipes don’t allow you to pull them up and away from the windshield. WTF? Also, I forgot i have an SUV now so i need a longer brush. Boo. We are two people short because people are weird. I’d like one normal day here. So this is something I just feel like rambling about. It crosses my mind every time I go by a Bojangles. I am sure many of you are aware of the idea of southern hospitality. Oh, the people in the south are nice! Blah blah blah. To some extent, this is true. Overall, the South’s culture places importance on slow days, tradition and being a good neighbor. A yankee’s bluntness offends us! However, like no other part of the country, a Southern will stab you in the back. The two-facedness here is horrible. Maybe that is why Trump (a damn spoiled Yankee!) won the South. Interesting! I have no idea what a Bojangles is. My cousin who used to be my roommate moved to Portland, OR and told me people are generally more patient, positive, and slow-moving than they are here. She says going to the supermarket is weird because you just want to pay and get out, but they take their time there and want to talk to everyone. Weird! Bojangles is the big fried chicken chain down here. Their specialty is chicken biscuits and sweeeeeeeeeeeeeeeeeeeeeeeeeeeeeeeeet tea. Oh man, if you run into someone you know at super market, add 30 minutes to your trip. If someone takes awhile at the market, you just assume they ran into someone they know. Oh my god Vermonters take forever at check out lines and it drives me crazy. I’m always wary of overly-nice people. I’m thinking ‘Yeah, but what are you REALLY like? !’ Maybe that says more about me! That said, though, who doesn’t love a bit of gossip?! London people are always in a rush – more than any other city I’ve been to. However, the drivers are more patient than in New York, where crossing the road is like playing Frogger. It was a massive shock going from there straight to Boston, where drivers wait for you to cross the road. London drivers are somewhere in between. Funny you mention the Boston drivers! I too was shocked they let you cross the street. Evidently, it is the law there, but it’s the law in many big cities down South, but they don’t stop for pedestrians. It was a massive shock going from there straight to Boston, where drivers wait for you to cross the road. Goalies seem to take awhile to recover from concussions. I am really concerned about Rask and the Bruins. 2. One of my classes I needed to get was full, but they switched it to an online class, so I am in! NICE! 3. After an impressive first round victory, my rec league hockey team got crushed 8-0. Woof! The other team got off to a two goal lead and never stopped. 4. The Patriots won, which is cool. I got up this morning, saw the thermometer was showing -2 degrees F.
The flag visible from the window was blowing almost straight horizontal. And the cars were still snowed in with >8″ of crunchy not-liquid water stuff. Jeez I hope you’re wrong about Tuukka possibly being done for the season. It wouldn’t necessarily mean kissing goodbye to the playoffs, but the Bs will need a hell of a lot more scoring power. If you’re at a loose end over the next nine Bruins hockey-free nights (other than the Superb Owl, of course), I’ve just started watching a Netflix show called You. Very good so far, very thought-provoking. I’ve heard good things about You. May check that one out this weekend. Watched the Fyre documentary on Netflix this past weekend. Rich people are stupid. Oh was that the elite festival that didn’t happen. I remember hearing about that. Fools and their money are easily parted, they say. If only I could work out how! Yeah it was about that festival. What a bunch of dipshits. Agreed on the scoring. GET A WIG FOR YOUR SECOND LINE, DONNY. Or maybe a wing. These are lovely, but they may not be effective. Thus naming each forward line according to their coif.